A Bellingham man is trying to help raise $26 million to honor the 26 lives lost at Sandy Hook Elementary School in Connecticut, where he was a fifth-grader some 25 years ago. Jeff Belanger, 38, said it has been surreal watching television news conferences take place at his beloved Treadwell Park, where he played countless soccer games, and to watch the small, unassuming town where he grew up become known worldwide for last month’s shooting rampage. The fund will be used to help victims’ families and first responders over the long term, to pay for a physical memorial, and, hopefully, to establish a college scholarship fund for Newtown graduates. With a 5-year-old daughter in kindergarten, Belanger said he can’t help thinking about what his life might be like if his young family lived in Newtown, where he spent Christmas with his parents, who still live there. Bellingham resident Jeff Belanger took several photos of the spontaneous memorials around his hometown of Newtown that sprang up in late December. 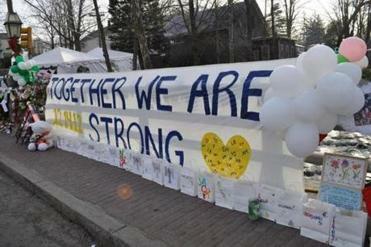 This banner was hung in the center of Sandy Hook, a village of Newtown. He began helping to establish the fund with a couple of his classmates at Newtown High School just two days after the shooting that claimed the lives of 20 children and six adults on Dec. 14. The fund’s board of directors includes public officials, a Newtown school teacher, a licensed psychologist, a police officer, and local business leaders. “It’s a close community so it’s going to take a good while to heal, and there will always be a scar there. 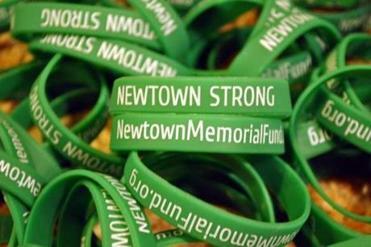 Always,” said Newtown Selectman Jim Gaston, who is on the fund’s board. Over the next two months, Newtown officials will be reaching out to the community to talk about what to do with Sandy Hook Elementary, he said, and whether it should be knocked down, turned into a park, or changed in some other way. “I can’t tell you which way it’s going to go,” said Gaston. One idea for a memorial, either on the site if it becomes a park or at another park in town, is to build a carousel with 26 horses, he said. The fund’s founder, Belanger’s classmate Brian Mauriello, has a son in the first grade at another elementary school in Newtown. The fund is designed to be around for generations, Mauriello said. He has been talking with people who dealt with the fallout from two mass shootings in Colorado, at Columbine High School in 1999, and in an Aurora movie theater last summer, to learn from them. Unfortunately, those tragedies left divorce and problems with drugs and alcohol in their wake for the families who had to cope with losses, he said. The survivors “are going to have difficulty adjusting to life, going forward,” said Mauriello. The Newtown fund could help with “everything from psychological support, to maybe retraining, return-to-work type programs, helping them find jobs that work with whatever new reality this has created,” he said. Tim Napolitano, also a member of the fund’s board, is a former Sandy Hook teacher who now teaches fifth grade at another Newtown school. He talked to the Globe by phone from the Chalk Hill School in Monroe, where Sandy Hook students are attending school. Napolitano was helping to organize books for a literacy center being set up at the school. Bellingham resident Jeff Belanger said “Newtown Strong” has become his group’s motto. “The important thing is that we’re just all trying to help the community heal,” said Napolitano, who knew several of the victims. Another board member is Police Sergeant Philip Hynes, who works in nearby Trumbull and lives in Newtown. He has a son on the Newtown police force, and has grandchildren who will go through the Newtown school system. Ed and Nancy Belanger, Jeff’s parents, live near Sandy Hook, and have been answering hundreds of e-mails for the newly established fund. “There’s so much sadness it’s unbelievable,” said Ed Belanger. In the days after Christmas, the unthinkable grief was still palpable around town. “There’s a lot of kindness. The people at the cash register at the local grocery stores, they’re very quiet. Everybody’s quiet. Everybody’s slow and quiet. The community is stunned,” he said. Over and over, all involved said the ability to channel the grief into some kind of help is comforting. Before the shooting, Jeff Belanger associated Sandy Hook with memories of laughing with friends at Dr. Demento recordings on the playground, and seeing huge green footprints painted along the roadway to the school. They were supposed to represent the school’s mascot, the Jolly Green Giant. 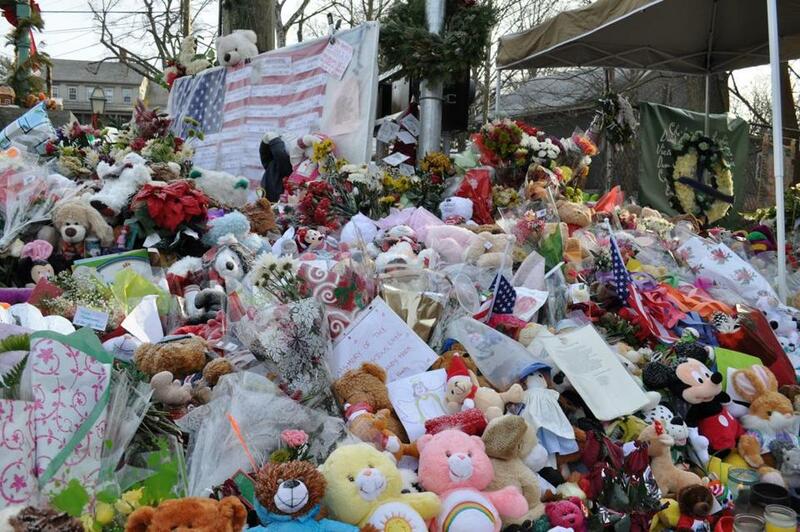 Then he heard the news, from CNN and Facebook friends in Newtown, and everything changed.